I am no longer amazed, but constantly saddened, by the large number of people I meet and sometimes have to deal with who see success in terms of how much damage they can do to another. I am saddened even more by the multitudes that stand on the sidelines and cheer on the bringers of destruction. The inflicting of damage is often excused, and even made to sound desirable by the dubious use of words such as competition or accountability. Another aspect of this smash and destroy mind warp is the willingness to exploit situations that in the moment has only a glancing reality to the victim. At the top of my list of purveyors of the smash and destroy mentality are Tony Abbot and Rupert Murdoch. They are joined by hangers on and also-runs like Alan Jones and Carl Sandilands who don’t really have a talent for anything. Hanging on to Abbott’s coat tails is the best they can do. Look at the way Abbott uses the word ‘Opposition.’ It is the excuse to attempt to smash and destroy everything the Government does. It is the excuse to oppose everything, a sad semantic exercise by a sad little man. Opposition in the true democratic sense is an unfortunate word. A true opposition in a democracy will support legislation it sees as desirable, question aspects where it can see as problematic, oppose legislation it sees as bad legislation. It does not men smash and destroy everything. Opposition leader has been a very good name for Abbott. No doubt having a head kicking political thug as ‘Leader’ has bought some advantages to the Liberals, but in the long-term advantages bought by such tactics often lead to self-inflicted terminal injuries. Power by any means eventually destroys the seeker of power. Rupert Murdoch has achieved what some see as success in the media industry through ‘Competition’ In healthy competition the competitors continuously challenge each other to do better. Each relies on the other for the motivation to do better and everybody gains. Murdoch’s competition involves using any method possibly to smash and destroy anyone or anything that gets in the way. One of the reasons this form of competition is so destructive is that the multitude of contributions that could have been made by those Murdoch has destroyed have been lost forever. Murdoch in this country has destroyed truth and accountability in the Australian Media and supported a despotic Opposition that has morphed into the Australian Tea Party. The pay-off for Murdoch in this alliance of the unholy is that the Opposition policy is to give the Internet in Australia to private entities. For ‘private entities’ read Foxtel/Murdoch. 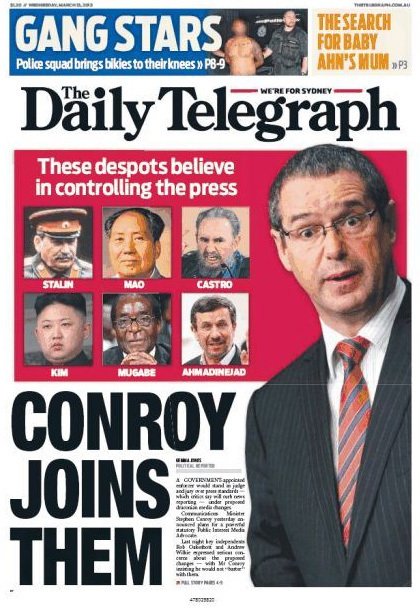 The only clear policy to come from Abbott is to give the Internet to Murdoch. This is something I oppose with all my being. My ability to rant on-line may not be much but if the ability for Bloggers and Micro-bloggers to rant against what they see as tyranny is taken away because if Murdoch owns the medium democracy in this country will be gone.